Well, after our unplanned roadtrip, we crossed our fingers and made our way back to The Trail where we left off. 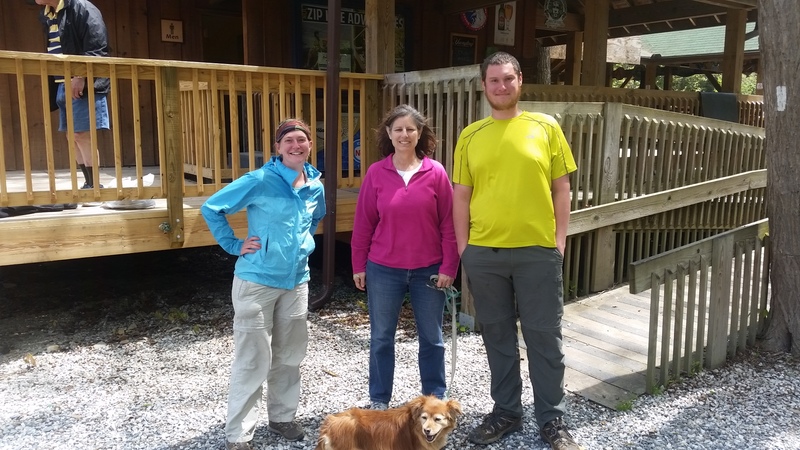 Beverly graciously drove us back to The Nantahala Outdoor Center (NOC), and after a quick lunch, we very happily resumed our hike. Thanks for the hospitality, Beverly!!! Since BigFoot hurt his big foot, we wanted to take it slow and steady, gradually increasing our mileage. 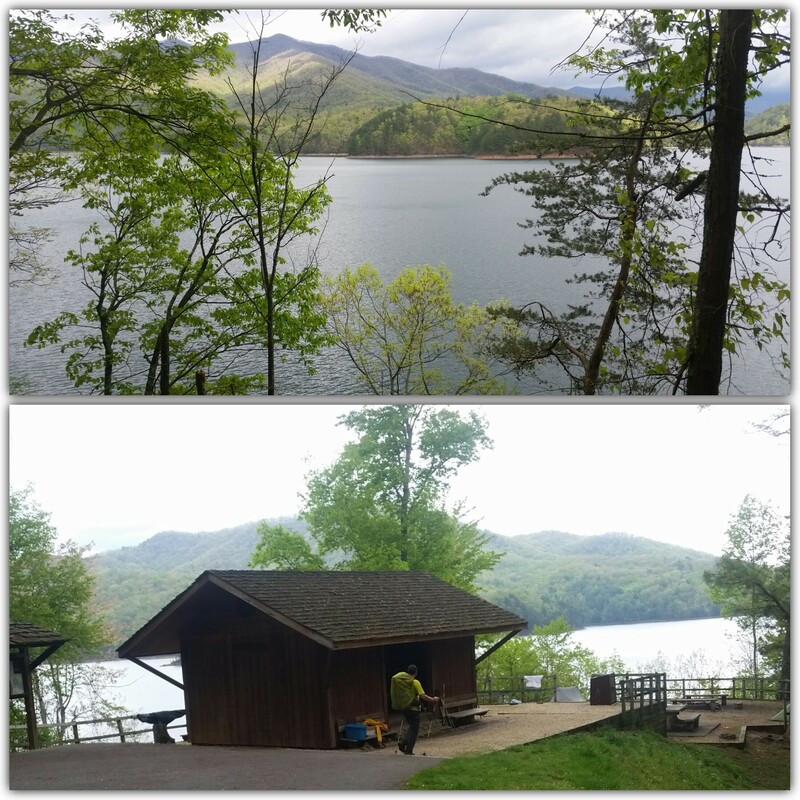 In 4 days, we hiked 28.5 miles to Fontana Dam. We are thrilled to report that BigFoot is healing!!!! After our time off, the mountains never looked so beautiful. I talked BigFoot into carrying “The Magic Boot” despite it weighing 2+ lbs!!! It’s working!!! Upon arriving at The Dam, we met a couple section hikers who gave us a ride 3 miles to Fontana Dam Village where a mail drop was waiting for us. We happily sorted our goodies which would take us from The Dam all the way through The Smokies and to Hot Springs. We could definitely feel the weight of 11 days of food. 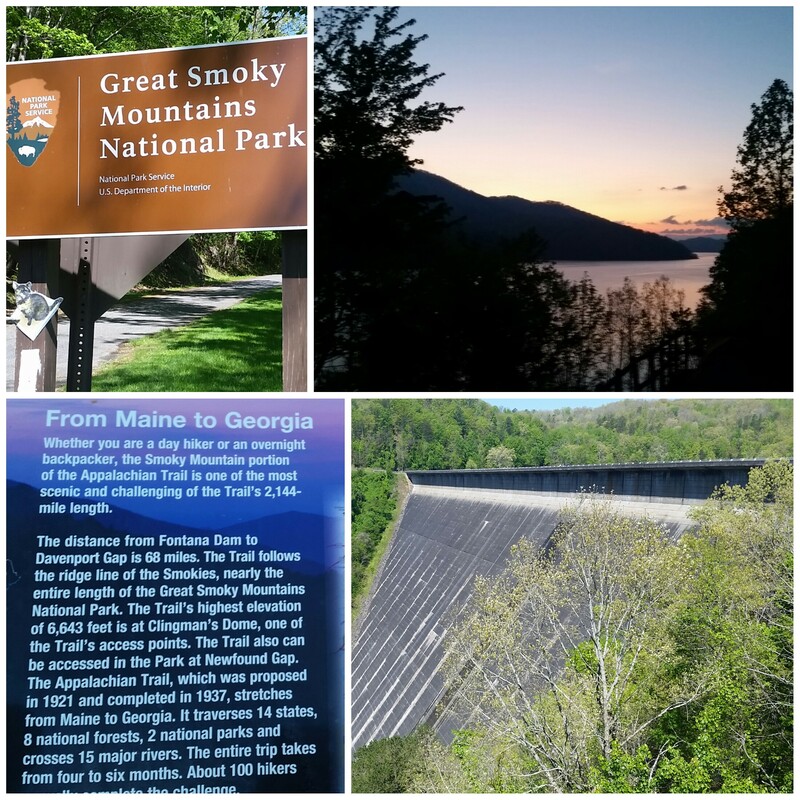 We woke up to the sunrise on Monday, crossed The Dam, and entered Great Smoky Mountain National Park on a blue sky, sunshiney day that turned into quite an adventure. After about 5 miles of climbing, we reached Shuckstack fire tower. Fellow hiker Rainman, BigFoot, and I dropped our bags eager to see the views of The Smokies. You can even see the dam. 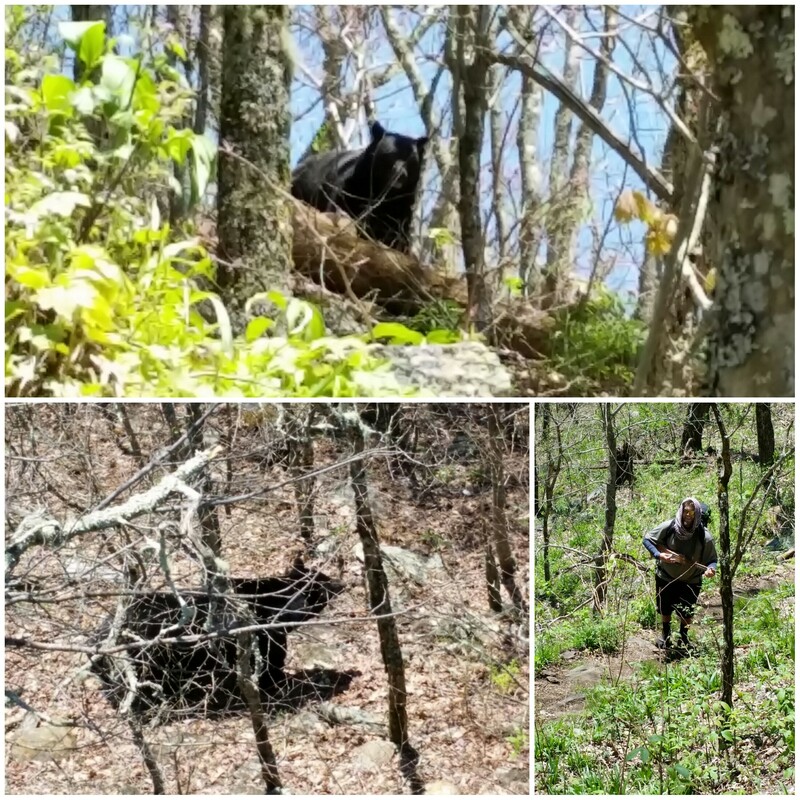 The three of us climbed the first set of stairs with an eye on the hungry black bear. We intended to eat lunch up there. I’m sure that bear is used to visitors eating up top and wanted its share. We quickly realized that our packs (full of food!) were at the bottom of the firetower and took turns going to retrieve them. We saw our friends Notes and Jedi approach and explained the situation. Jedi instinctively grabbed his guitar and played an improvised song about the bear to the bear. No joke, the bear was totally into the song. Thanks for the amazing pictures, Notes!!! Although we made several attempts to scare that bear off, it stood its ground. 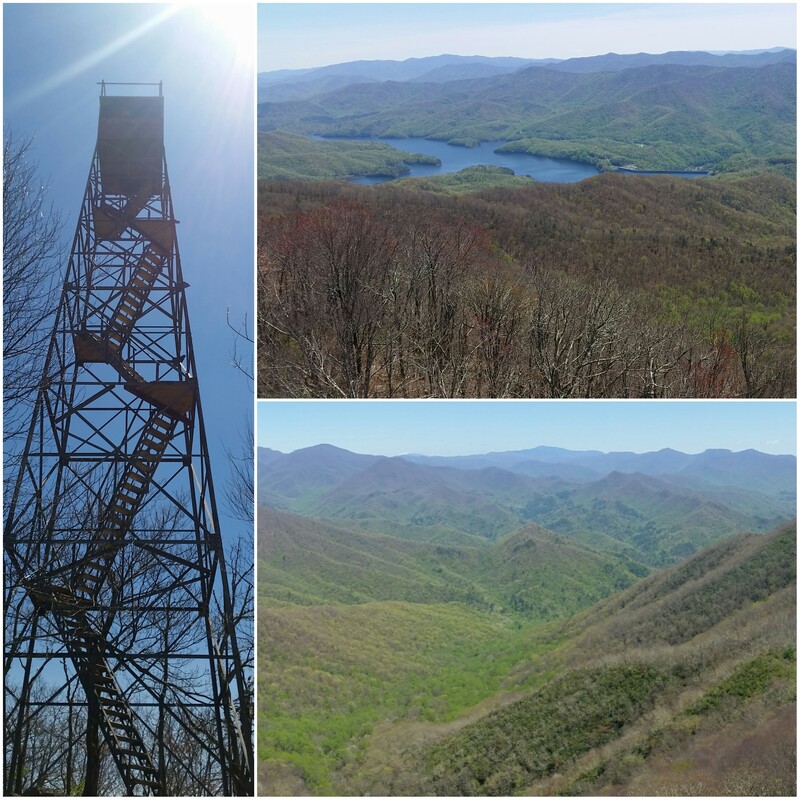 We managed to leave the firetower without problem and went back down the short firetower trail to where it crosses The AT to have our lunch. 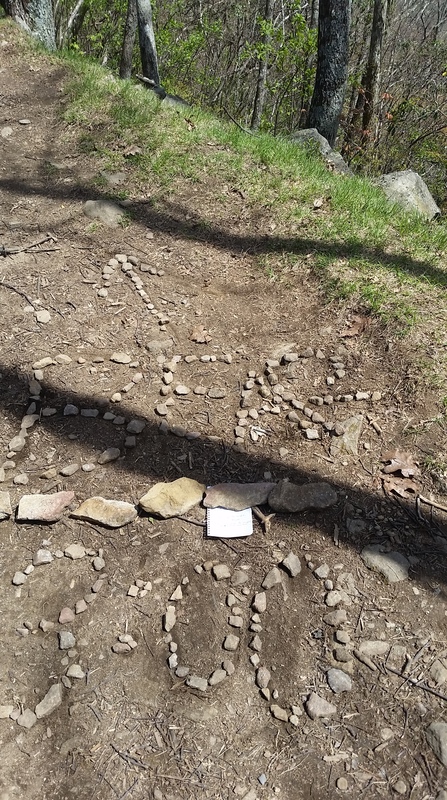 We decided it would be best to leave a note warning fellow hikers. Bear – 3:00, note had a little more info on it. Soon, another hiker, Spuds, joined our group of five. Spuds claimed that bears were all over Quebec (his home), and he was not afraid. With plenty of warning, Spuds and Jedi went to see the firetower. Big surprise. There was a bear. Not only was the bear present, it was IN the firetower. Jedi and Spuds returned unharmed, and the whole group continued hiking to the shelter for camp. 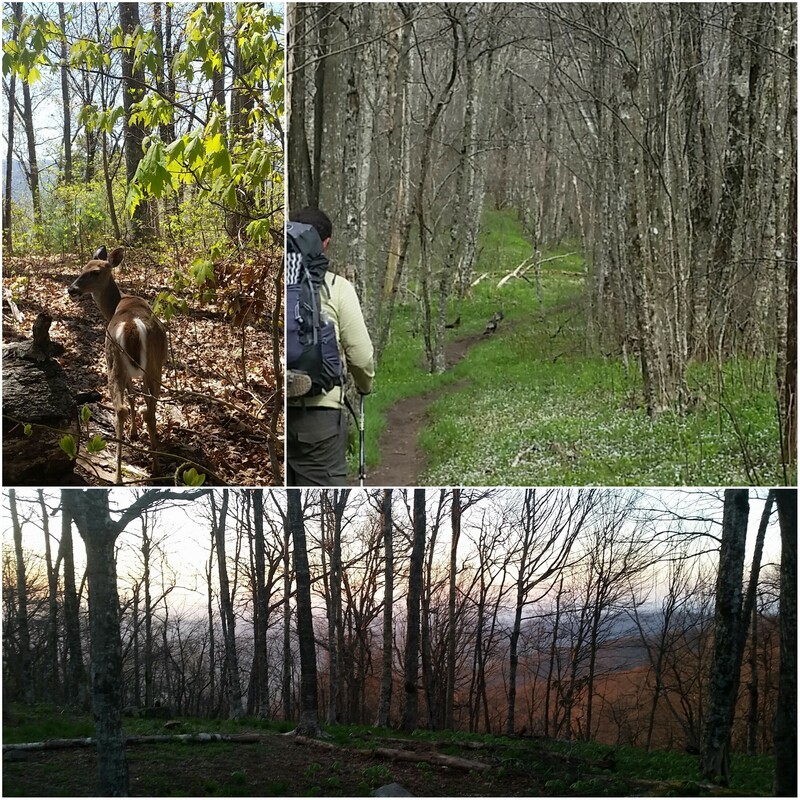 Our first day in The Smokies we saw the bear, two dear, three wild turkeys, the sunrise, and the sunset. What a day. 11 miles. The next morning, we were again blessed with a beautiful day. We continued climbing up and up, and the scenery did not fail to impress. We stood on top of Good Old Rocky Top for awhile taking in the 360° views. 12 miles. 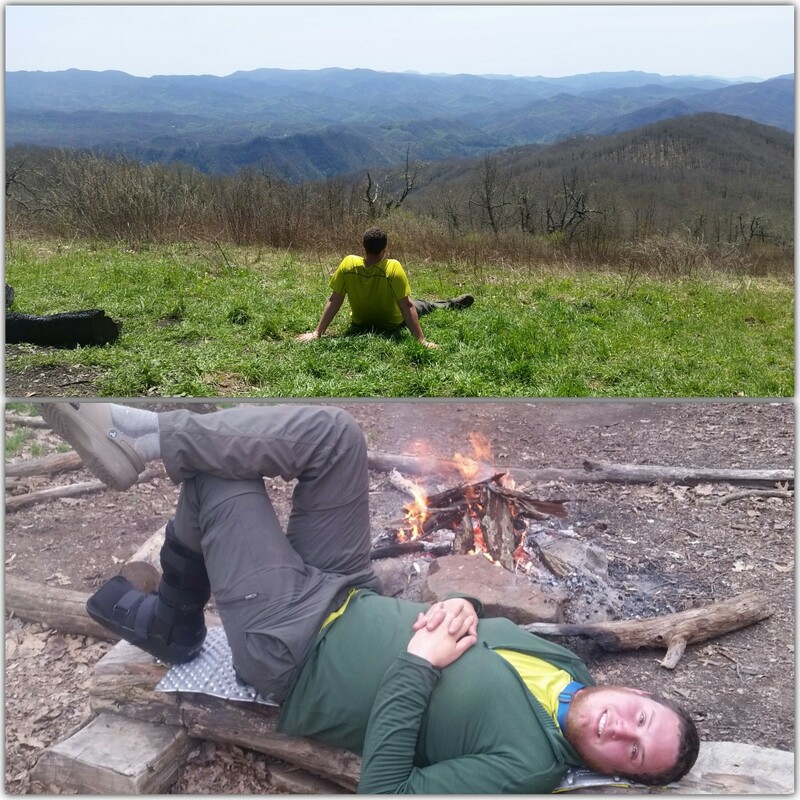 The third day in The Smokies we took pretty easy. 7.2 miles. Day 4 we awoke early to fog. 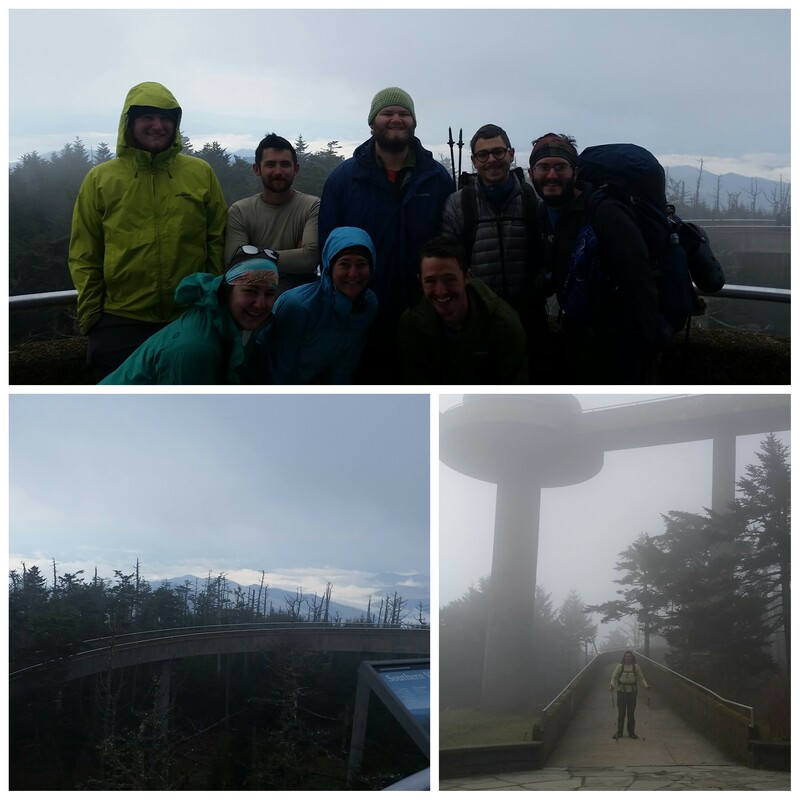 From the shelter, we hiked 3 miles to the highest point on The AT, Clingmans Dome. 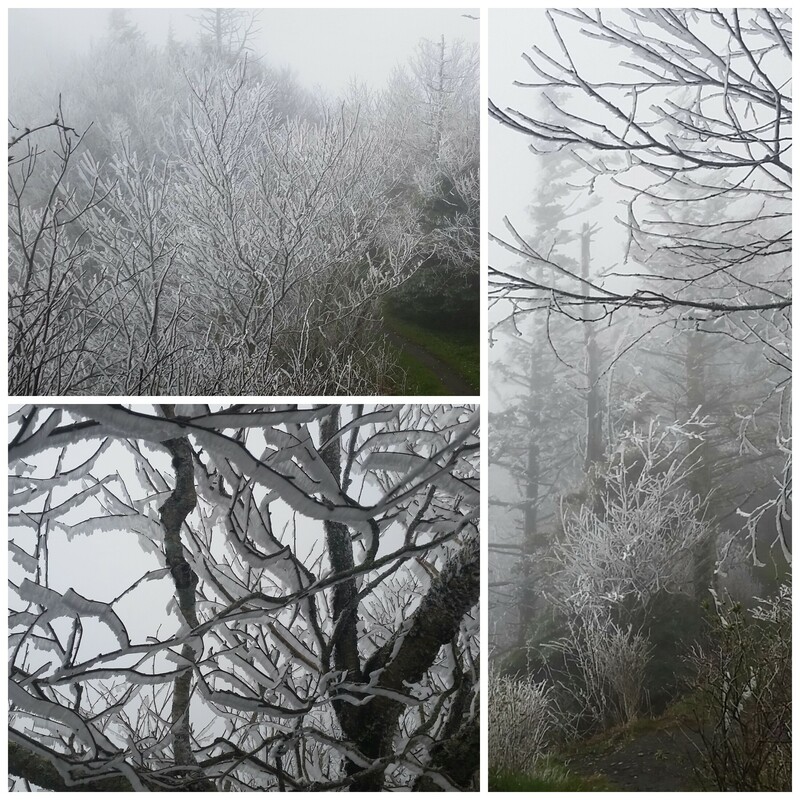 Clingmans Dome proudly claims some of the best views on The Trail. Well, not today. You win some, you lose some. We continued on our way to camp by way of Newfound Gap. 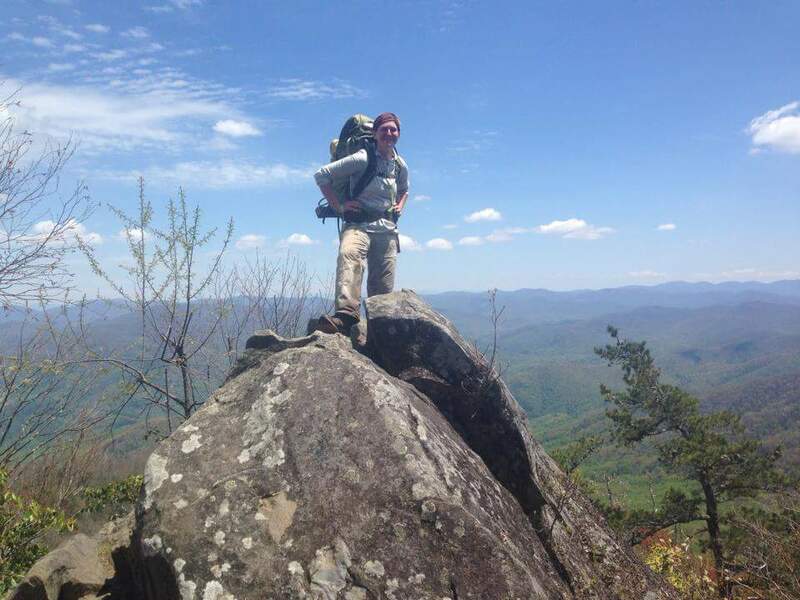 Here, many hikers choose to catch a ride to Gatlinburg for a hot meal and resupply. We still had plenty of food but were very grateful to encounter some Trail Magic. We enjoyed our snacks while watching tourists drive up, snap a pic of the mountains, and drive away. Many of them didn’t even exit their car. A few miles later, we reached the shelter. And just in time. Upon arriving, the rain began. Which turned to hail. Which turned to snow. We made dinner and quickly crawled into our sleeping bags. 13.8 miles. In the morning, we awoke to frozen ground and icicles dangling from tree branches. We hiked quickly through the frost to keep warm. 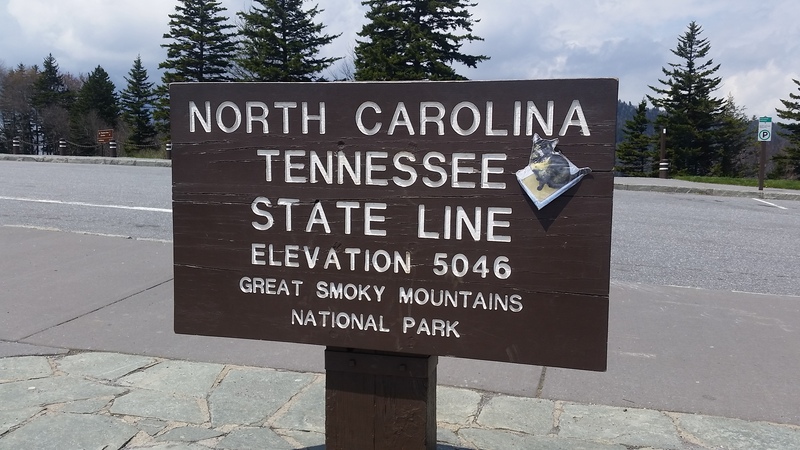 The guidebook stated at least 6 good spots for views including Charlie’s Bunion. It’s a little disappointing to ride the ridge all day staring into nothing but blankets of thick fog. But, so be it. 12.6 cold miles. 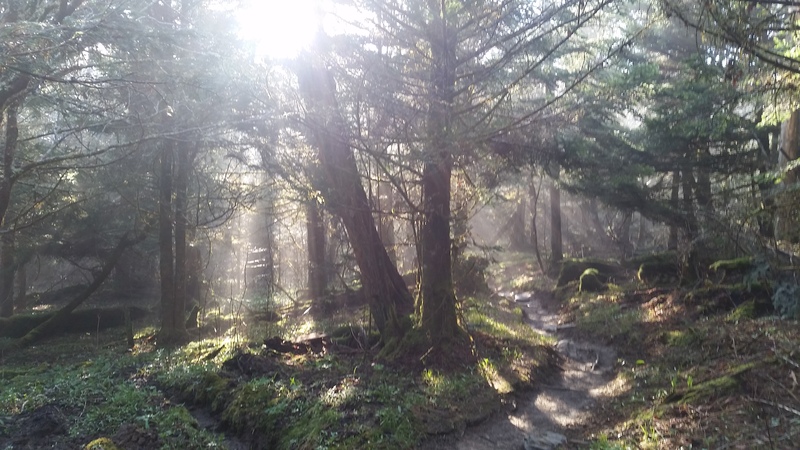 Our final day in The Smokies was, thankfully, a beautiful day. We descended nearly 4,000 feet to the last shelter inside the park very grateful for the views. 14.8 miles. 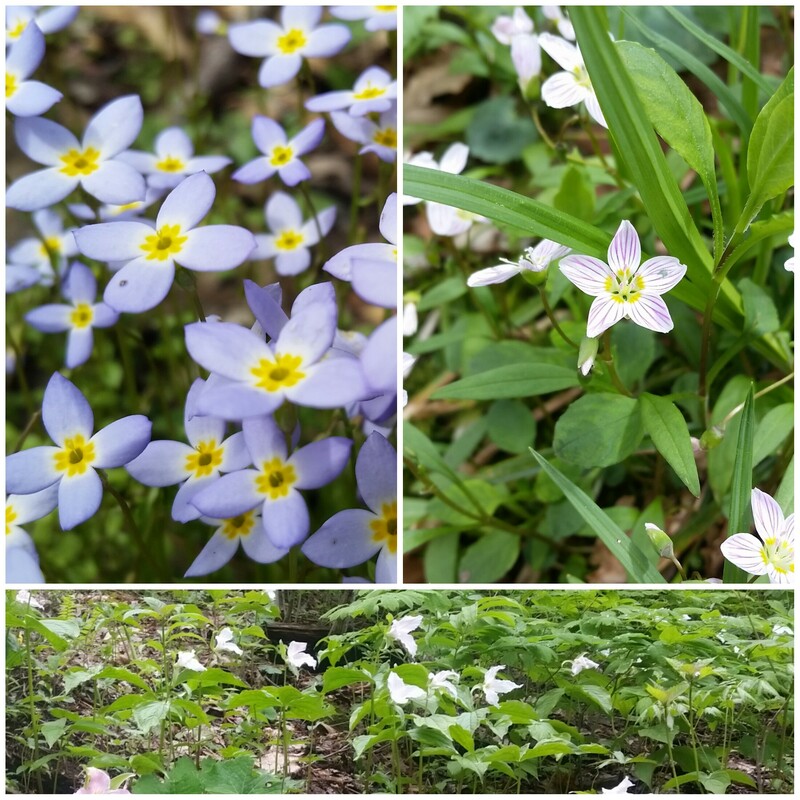 The Smokies were quite an adventure, and we both agreed that we would like to hike it again. 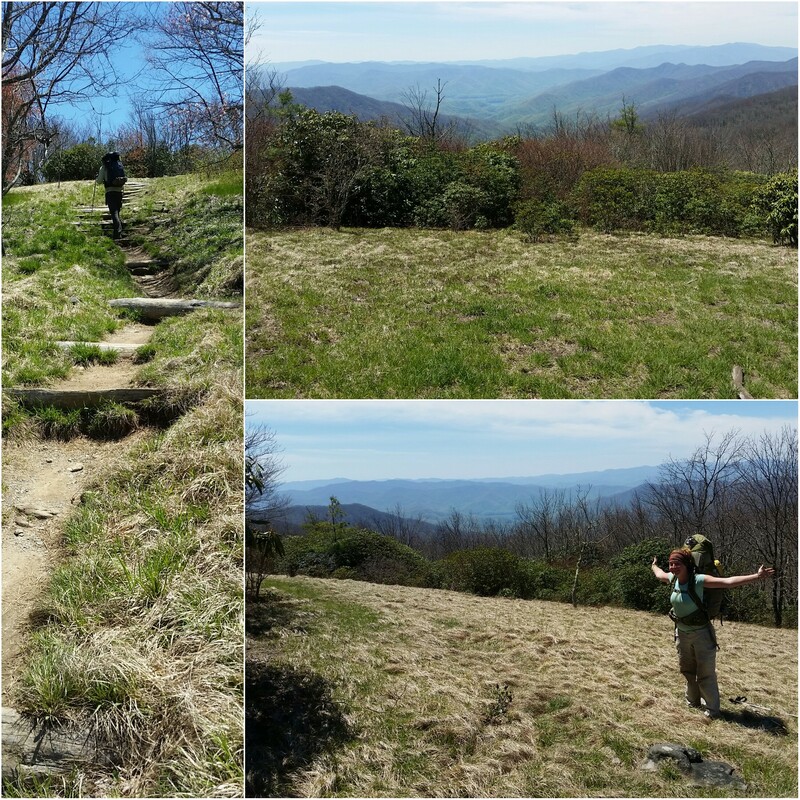 From The NOC through The Smokies, we hiked 99.9 miles in 10 days!!! Long story short – WE’RE BACK!!!!! Exciting bear stories! We didn’t see one until we got to Shenandoah so consider yourself lucky!